Cory Watson Attorneys, a nationally recognized personal injury law firm based in Birmingham, Alabama, has named Hamilton Jordan as a new associate attorney. Cory Watson Attorneys welcomes new associate Hamilton Jordan. Hamilton Jordan earned his undergraduate degree from Auburn University and his Juris Doctor from Samford University’s Cumberland School of Law. His compassion and desire to help those in need brought him to Cory Watson Attorneys, where he focuses his practice on areas such as products liability, civil litigation, motor vehicle accidents, and personal injury law. 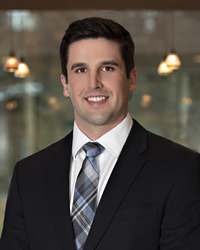 Prior to joining Cory Watson Attorneys, Jordan represented clients in numerous fields of personal injury litigation involving car accidents, tractor-trailer accidents, and premises liability. Jordan has also practiced in general civil litigation, including products liability employment law, sexual harassment, and insurance defense. Cory Watson Attorneys is a nationally recognized personal injury law firm based in Birmingham, Alabama, with more than $2.7 billion in recoveries for clients. Attorneys are frequently appointed to leadership positions in national cases involving pharmaceuticals and defective medical devices. Firm practice areas include Personal Injury, Product Liability, Class Actions, Mass Torts, Pharmaceutical Litigation, Wrongful Death, Asbestos, Mesothelioma, Car Accidents, Truck Accidents, Catastrophic Injury, Aviation, Recalled Products, and Environmental Litigation. To learn more, please visit http://www.CoryWatson.com.